Comedy Central's “Review” drags the art of criticism down a dark, surreal rabbit hole. We currently live in the golden age of anti-hero television. Shows featuring unlikable protagonists who consistently destroy their personal lives through repetitious mistakes are the current zeitgeist. But this golden age has come at a cost: an absolute dearth of situation comedies. NBC is no longer the king of quality sitcoms; the reign of “Friends” and “Seinfeld” came to a close over a decade ago. The second wave of sitcom greatness—with shows such as “The Office,” “Community,” “30 Rock,” and “Parks and Recreation”—have similarly ended. Perhaps more worryingly, no network or streaming service appears to be making efforts to replace them. Enter “Review,” a shining, comedic bright spot in the TV darkness. 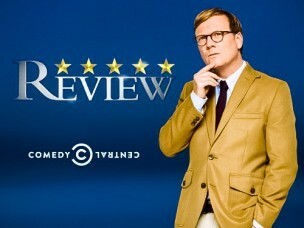 The show, which recently ended its second season on Comedy Central, is a mockumentary about Forrest McNeil (Andy Daly), a man who attempts to review major life experiences on a five-star scale, as submitted by his viewers. These experiences range from having a best friend to committing a murder. “Review,” in this moment, establishes many things, but primarily it tells its audience exactly what kind of show it is: a tragicomedy about the search for objective value in life. Forrest’s folly isn’t his sense of courage, fatalism, or nihilism, but something else he cannot see altogether: the fact that life experience is inherently individualized and random, not universal or shared. By attempting to find objective value in shared human experiences, he fails to find the subjective value in his own personal experience. He mentions later in the pancake-voiceover that he feels dead inside; to him, the feeling is Suzanne’s fault. However, the viewer can see that it is Forrest’s fault for not trying to find happiness in their relationship, and for focusing too much on his search for absolute truth. The pancake scene is also a sly meta-commentary on the appeal of “Review” to its audience. Indeed, cruelty has always been a source of comedy and entertainment, from the Roman gladiators to “America’s Funniest Home Videos.” Random cruelty is often quite funny, but only “Review” dares to make its audience members laugh and then asks them to question this sensation. In spite of this knowledge, the cruelty inflicted on Forrest (and that Forrest inflicts on himself), is an absolute delight to watch. “Review” is one of the funniest shows on television, if only because of Forrest’s unwavering commitment to the ridiculous. While on the job, Forrest lets his father’s house burn to the ground rather than stand on his feet, instead of his knees, to grab a fire extinguisher; if he were to do so, how could he possibly review “life as a little person?” All 19 episodes of “Review” are disturbing, scary, and undeniably hilarious. Enough cannot be said about Daly’s performance. A deft combination of infallible confidence and awkwardness make his turn as Forrest Emmy-worthy. In Daly’s hands, a character that would otherwise be unlikable is vibrant and affable, a hero the audience can root for in spite of his obvious stupidity. It’s in the second season that the show’s sense of poignancy and tragedy become more pronounced. Going back to the pancake scene, it’s here that the balance between fatalism and nihilism is established, and these conflicting philosophies make up the crux of Season 2’s thematic tension. Over the course of 10 episodes, Forrest is shot by arrows, left out at sea, and faced with eight other near-death experiences on the job. It’s in the finale that Forrest accuses his producer, Grant (James Urbaniak, brimming with brilliant false earnestness), of concocting a conspiracy to murder him by choosing only the most deadly reviews. Though the episode never definitively states it, the conspiracy is nonsense, a means for Forrest to cope with the random cruelties inflicted upon him through a fatalist theory. The reality is that Forrest has placed his life at the mercy of both his viewers, who ask him to review life, and those with whom he interacts on his journey. It’s a nihilistic world that Forrest has placed himself in, yet “Review” suggests this cruel, random world is one we all inhabit. After all, Forrest isn’t the only one who suffers: Suzanne certainly does, and those who inadvertently become a part of Forrest’s reviews often do too (his father, several prison guards, etc.). In life, it seems, we are all at the mercy of each other. Forrest just makes that part of his job description.